Pre-order your limited run copy of Deviation: Positively ExtraOrdinary. Issue 002 features Summer Rayne Oakes, James Carpenter, Magdalena Sawon and a host of other New York City and Los Angeles-based artists and creators. Now available for $19.95. Interweaving Deviation’s philosophical principles with stories about those in the arts, no other media outlet portrays the artist’s struggle through the lens of ethically straying from the norm. We speak of the process of becoming, or the eternal flux of creative existence. Transcending the importance of their completed works, we delve into the nitty-gritty of the artist as a perpetual work in progress. It’s not about fast food culture and the shiny untruths that are so often presented as success, but the fundamental human truths embedded in the struggle to create. 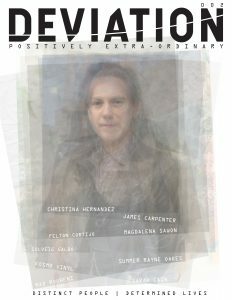 Pre-order your digital copy of Deviation: Positively ExtraOrdinary. Issue 002 features Summer Rayne Oakes, James Carpenter, Magdalena Sawon and a host of other New York City and Los Angeles-based artists and creators. Now available for $2.95.